A vision of exquisitely detailed patterns, this striking quilt set has everything you need to bring a bold, bohemian vibe to your bedroom. 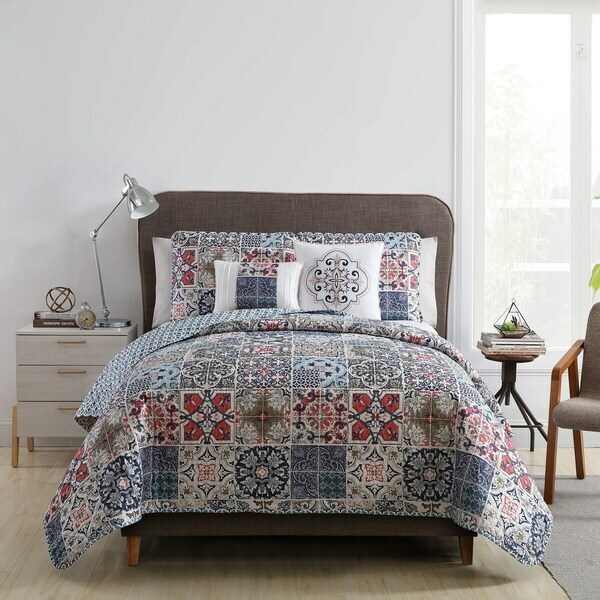 The reversible quilt boasts a beautiful patchwork of Moroccan-inspired tile patterns on one side and a small quatrefoil print on the other—two stunning styles for one great value. The set includes a quilt, matching shams (one sham for Twin/Twin XL), an embroidered square pillow, and a pleated rectangular pillow for added texture and flair.